The menu and interface are directed at new owners/players... which is to be expected of a title that launched alongside the original Nintendo DS here in the United States. The opening credits aren't particularly long and the download time is average to good. The tappable areas are (intentionally) restricted to the word balloons, but the areas are large, well-labeled, and sufficiently separated from each other. Unfortunately, nothing in this game is easy to do. The drawing area is smaller than the Nintendo DS's built-in PictoChat. The on-screen keyboard's keys are small and awkward. Quick use buttons like "send" and the ability to switch between capital letters/lowercase letters/symbols move around. Some of the category clues for Multiplayer Doodle's preselected clues make no sense (the same goes for some of the words). The difficulty typing affects both Multiplayer Doodle and Multiplayer Hot Potato, which also has a self-defeating lack of randomness. Also, single-player games cannot be played by game-owners while they're chatting with guests. The main feature - the chatting feature - is vastly inferior to the PictoChat program that is built into the Nintendo DS. The two mini-games each have flaws. The characters are customizable with an admittedly large number of options, but only for game owners (guests are aliens, which are arguably cooler than the customizable humans). The music, which is only available to game owners, is so mind-numbingly repetitive that the host will undoubtedly turn off their music (or their sound entirely). The sound effects make players aware of messages or bombs on their screens, but no other significant purpose. Admittedly, I've played a lot of Nintendo DS games, both recreationally and for reviews (this is the 112th review posted here at DSSingleCard.com). Every game I've played has something you're supposed to accomplish. Defeat the bad guy. Finish the story. Complete the puzzle. Get as far as you can with the puzzle. Keep the beat. Beat the record time. Make people laugh. 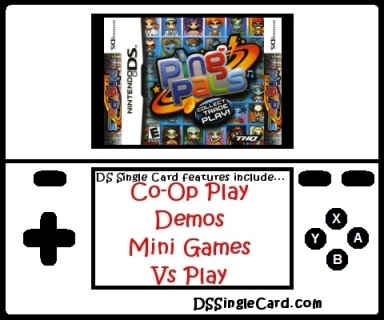 Ping Pals, while playable as a single-player set of less than a handful of Mini Games, is intended as a multiplayer game, yet it has no multiplayer goal. The Mini Games are a joke. The chatting is inferior to PictoChat, which is built into the Nintendo DS system (thus meaning you don't have to pay extra for it). In addition, the game was released before the system's Wi-Fi development kit was fully activated and distributed, so it doesn't even take the chatting online. There's really nothing here to justify spending any of money, even a single dollar. Stay away. You've been warned. Allow game owners to broadcast the demo from within the chat session. Permit players to "zoom in" on the keyboard when typing. Separate the "send" and capitalization/symbol buttons from the main keyboard. Change the categories and clues around for Multiplayer Doodle, or let players enter their own. Randomize the bomb's detonation time for Multiplayer Hot Potato. Let game owners play single-player games while still in a multiplayer chat room.